Serie A and Serie B round up! Since it is too depressing writing about Milan's poor displays in Serie A I would rather do a quick round up on this weekend's games in Serie A and Serie B. I hope to start doing a Serie B round up every weekend too keep everyone up to date about what is happening. One of the "big-matches"of this weekend happened last night when Juventus travelled down south to take on Reja's Napoli. The napoletani have managed to impress so far this season and dreams of a UEFA spot have started. In an eventful game Napoli took the lead through Gargano while Del Piero brought the two teams level. Two "phantom" penalties were then handed to Napoli which saw Domizzi make no er rors for Napoli to see Juventus loose their first game this season 3-1 and it is their first loss in Serie since Milan beat the bianconeri at the San Siro with the same score line two years ago. Rage over the Bergonzi's fase penalties have started. Inter were held to a 0-0 draw at the Renzo Barbera stadium in what was a boring game that saw inter handed a blow as Dejan Stankovic was stretchered off due to an injury. Worries over the injury have been raised by Moratti. However, last years champions still maintain a 3 point lead over second placed Roma who managed to beat Inter's cross town rivals at the San Siro with a goal by Mirko Vucinic. The rossoneri are still without a win at home this season. Livorno continued to look destined for Serie B football next season when they fell behind to Parma but after drawing level twice Paci managed to net the winner in a five goal thriller at the Ennio Tardini stadium. Later tonight Fiorentina will take on an in-form Genoa at the Marrassi. 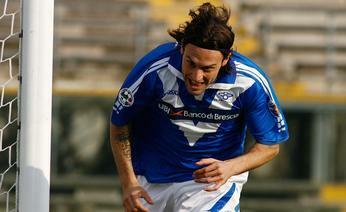 Grosseto stunned last season's Serie C champions, Pisa, with a 2-0 win over the Tuscans. It was the nerazzuri's first away loss of the season which saw Brescia leap-frog them to the top of the table after their impressive 4-1 win over Triestina. Chievo continued to challenge for promotion with an impressive 3-1 win over Piacenza as they claimed second spot with 24 points, Pisa too, with the same points. But it looks like Beppe Pillon isn't going to perform the miracle he did a few seasons ago as Treviso are lying at the other end of the table after failing to win, yet again, as they lost 1-0 to Ravenna. The chase for promotion is looking good and we certainly have a great Serie B campaign going on. Milan show Sampdoria who they really are! Gilardino and Seedorf bring down Shakhtar!